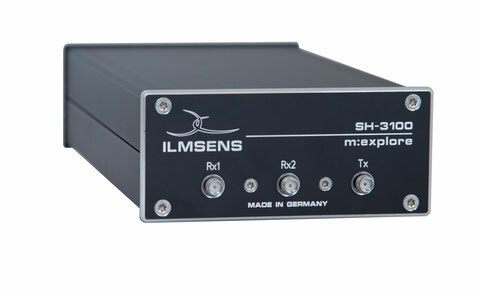 The revolutionary Evaluation Kit by Ilmsens offers many practical and scientific applications in the area of wide-band microwave sensors based on the unique M-sequence technology. The m:explore is an energy-efficient professional measuring device with a very high frequency range. It has been developed for many different measuring requirements. The m:explore reliably serves four fields in total: Impedance spectroscopy, microwave imaging, short-range radar as well as network analysis & time-domain reflectometry. Learn about all the important application options of wide-band microwave technology with the m:explore and convince yourself of the outstanding properties and performance parameters of our technology. The high measuring speed, compact and robust build of the measurements and the outstanding long-term stability permit entirely new usage scenarios of different methods and measuring procedures. The modular concept with its flexible components permits simple adjustment to your needs in research and industry. With our OEM modules, we offer customer-compatible solutions for your products and productions, thus creating the prerequisites for informative networking pursuant to the "Industry 4.0" concept. Try out our technology under your conditions and let our offer convince you! Initiated with the key word "Industry 4.0" and supported by IT, increasing amounts of information can be linked and evaluated. We offer a unique added value to you and your customers with our OEM modules and create the prerequisites for information-technical networking in process control and research work. Our new sensor concepts and new sensors permit comprehensive, informative networking across the entire production process, making it possible to efficiently master and control the increasingly complex processes and production technologies. After you have been able to experience our technology and to validate it for your uses, we will make our experience and technical knowledge available to you as a partner for OEM modules. We will analyse the results of the test phase with the m:explore with you. We will develop the perfect sensor for you and help you implement our modules and technology in your assemblies. We are the ideal partner for you with the modular build of the m:explore, the integration capacity of the technology on semi-conductor chips and our attractive prices for small and large piece numbers. More than a thousand measurements per secound covering the whole frequency range at one shot. The m:explore is self tempering, has a wide input voltage range, and still works when laboratory equipment is already out of order. Due to modulare architecture ready for your cost or space sensitive operation purpose.